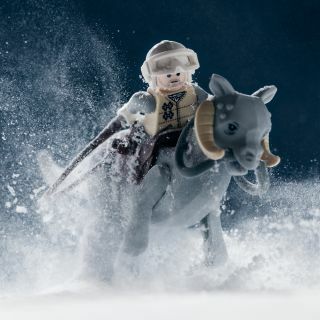 This photo from "Lego Star Wars: Small Scenes from a Big Galaxy," out Nov. 10, called "Breaking in the Tauntaun," was four years in the making. "Lego Star Wars: Small Scenes from a Big Galaxy" (DK Publishing, 2015), available Nov. 10, is full of classic Star Wars views with quirky twists: snowball-fighting snowtroopers (captioned "Ha! Ha! Missed again! "), storytelling Ewoks and series mainstays under attack. The new book collects scenes from Tatooine, Hoth and Endor, mixing dramatic character shots, action scenes and views of the characters' everyday life in a large, glossy format. "Lego Star Wars: Small Scenes from a Big Galaxy" (DK Publishing, 2015) by Vesa Lehtimäki. Lehtimäki's project started when he was photographing his son's toys, but he soon realized that the little Star Wars Legos were worth a larger-scale project. To create more involved tableaus, he expanded far outside the scope of just Legos: shooting outdoors, shining lasers and using quite a lot of baking soda in place of snow. According to the book's introduction, Lehtimäki's Lego Star Wars photos have made appearances on a variety of online media, but this is the first time it's been collected into hard copy — just in time to celebrate the release of "Star Wars: The Force Awakens" in December. "Early Morning Endor Scout" incorporates nature into the pages of "Lego Star Wars: Small Scenes from a Big Galaxy." The 176-page book focuses on the original "Star Wars" trilogy, and comes with a behind-the-scenes section at the end that describes the photographer's process and how to reproduce the more unusual elements of his work, like falling snow. The process can be very intensive, but some shoots go more quickly than others. "It varies a lot," Lehtimäki said in a Q&A provided by DK Publishing. "I would have to say it's from one hour to four years." "Hoth: The Dawn After" shows the end of the Rebel Alliance's presence on Hoth in "Lego Star Wars: Small Scenes from a Big Galaxy."